One of the most interesting features in the upcoming Nikon Z6 and Z7 mirrorless cameras is in-body image stabilization – a first for Nikon. Although other brands have had IBIS for years, including Sony, Olympus, and Pentax, the traditional DSLR manufacturers (Canon and Nikon) have used optical image stabilization in their lenses instead. There are pros and cons to IBIS, though, and we don’t yet know exactly how Nikon’s system is implemented. So, should we be excited or dismayed? Today, there are three main vibration reduction systems you’ll find on the market: in-body image stabilization, optical image stabilization, and digital image stabilization. The last one is just software tricks, and it isn’t common on most high-end cameras (more frequently seen in phones for video). Instead, the two we are interested in here are in-body and optical stabilization – IBIS and OIS respectively. IBIS works by moving the sensor inside your camera in order to compensate for the camera movement. The camera has built-in accelerometers to measure lateral motion, correcting the sensor by moving it left/right and up/down. 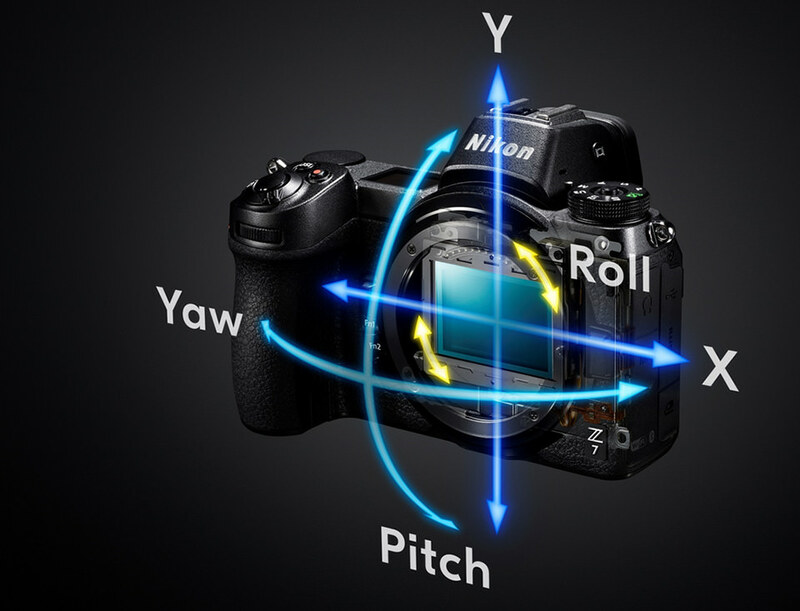 Some cameras also have gyroscopes built-in to detect rotational movement, including the Nikon mirrorless cameras, which have five-axis image stabilization (horizontal, vertical, yaw, pitch, and roll). OIS is a feature of lenses rather than camera sensors. It goes by different names depending upon the manufacturer: vibration reduction, image stabilization, vibration compensation, and so on. OIS works by moving the elements within a lens to counteract any vibration detected by its sensors. Which Stabilization System Is Better? Neither IBIS or OIS is necessarily better than the other, as we have covered before. It depends upon your needs, as well as the lens in question. One of the huge benefits of IBIS is that it works with any lens you use, including adapted lenses that may be several decades old. This is a huge deal for photography, especially if you have a collection of non-stabilized glass that you want to use handheld (think something like the Nikon 85mm f/1.4). It’s an even bigger deal if you’re a video shooter, since you now have a much, much wider range of lenses that are usable handheld. Nikon’s decision to include IBIS in its new mirrorless cameras just injected some life into all its old manual focus lenses and we know that the F-to-Z-mount adapter will work with IBIS, which is great! Remember, too, that Nikon is announcing a 35mm f/1.8 and 50mm f/1.8 lens with their new cameras, which means this is also the first time you’ll ever be able to use a Nikon 35mm or 50mm prime on a native camera with vibration reduction. That is a big deal for many Nikon shooters, since those two lenses are already on-the-go primes, ideal for handheld shooting. Another benefit, in theory, is that cameras with IBIS can still use lenses with OIS, potentially with both systems engaged simultaneously. Although it depends upon the implementation of the camera – and it’s certainly possible that Nikon won’t allow both to be used at the same time – the result could potentially be a system that works better than either stabilization system on its own. We’ll need to wait and see, but at least it is a possibility. However, OIS has some benefits of its own, including that it can be optimized for the particular lens in question, sometimes leading to better results. Not everyone likes using image stabilization, especially if you are using a tripod in non-windy environments and aiming for maximum image quality. However, if you’re using a monopod or handholding your camera, it tends to be better to leave VR on rather than off. Still, some photographers will prefer OIS instead, since it does have some benefits in certain scenarios. So, is it a good thing that Nikon is rolling out IBIS in its new cameras? The takeaway, in my opinion, is simple: Nikon’s new mirrorless cameras have five-axis IBIS, which you can turn off if you like. And, if Nikon ever releases a Z-mount lens which they believe needs OIS in order to be effective, I strongly suspect they’ll add it just like normal. We also don’t yet know if Nikon’s current VR lenses work in tandem with the new IBIS, but it is quite possible that they will. Taking all that into account, I see the advent of IBIS in Nikon’s new cameras to be an exciting development indeed, and certainly much more of a positive than a negative. At the very least, we no longer have to worry about which lenses of ours have VR and which do not; everything is stabilized. Video shooters and photographers with non-stabilized prime lenses have the most to be excited about, although everyone can enjoy the benefit of smaller, less expensive mirrorless lenses along the way. I’ve seen that IBIS on Z6/Z7 should offer 5 stops with Z-Lenses, but only 3 stops with adapted lenses. Any reason why? Is it due to the longer Flange distance? Interesting, this does seem to be confirmed – the Z6 and Z7 IBIS doesn’t perform as well with external lenses, only correcting along the pitch, yaw, and roll axis. Not sure about the three-stops measurement, though. Nikon still claims 5 stops. Interestingly, we also have confirmation that the IBIS system will work in tandem with VR lenses, which will take over the pitch/yaw axis when used with the Z6 and Z7. Still not sure why Nikon avoided horizontal and vertical translation stabilization with all adapted lenses. Another advantage of OIS: its effect can be seen in the optical viewfinder of an SLR camera, which wouldn’t be true for an SLR with IBIS. How does IBIS work on a tripod? When you sing OIS you turn it off when mounted to a tripod d, can you do that when th IBIS, or do you not need to?